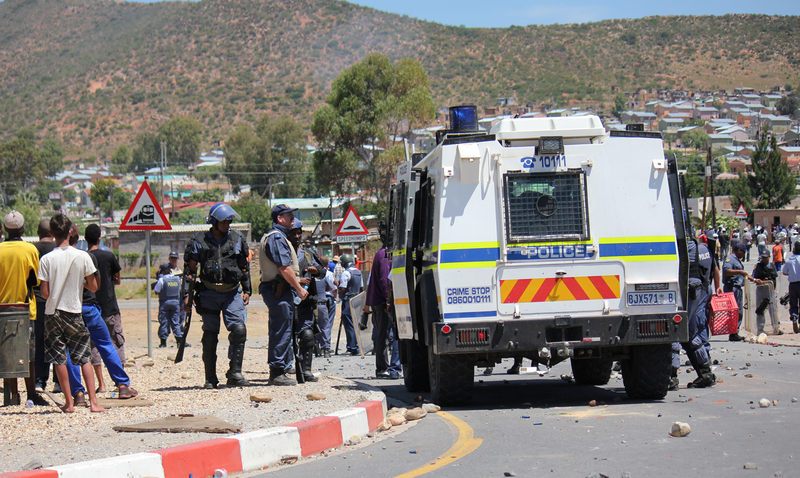 Thursday was a day of marginally less violence in the Western Cape’s week of ongoing protest. For one thing, there were no reported fatalities, though by nightfall it seemed that tensions were escalating. What will be most worrying to authorities are indications that the protests are spreading to areas where they have little or nothing to do with farm labour conditions. By REBECCA DAVIS. Just when we thought we were getting a handle on things, they get more complicated. The narrative of dissatisfied farmworkers lobbying for a rise in minimum wage to R150 a day is no longer sufficient to explain the unrest in the Cape’s fruit-growing region. On Thursday, the major pressure point of the area was the Overberg town of Swellendam, where the issues seemed to be utterly different. In Swellendam, where tyres were burned, rocks were thrown and shops were looted, tensions reportedly began building on Monday night. Swellendam’s municipal affairs don’t get a lot of press outside the region, but it appears there’s a murky saga underlying this, with accusations of corruption, maladministration, and the inescapable party-politicking. A year-long investigation by the government’s Special Investigating Unit found numerous irregularities in the operations of the town council, with the Weekend Argus reporting at the end of the October that the unit had identified “possible conflicts of interest and failures to disclose business interests on the part of no fewer than 61 members of staff and the council”. Up until October, the town council consisted of four DA councillors and four ANC councillors, with the balance of power going to the DA in a coalition with a lone ACDP councillor. The DA councillors allege that paralysis within the council ensued because of the failure of ANC members to attend meetings. In October the ANC claimed that they now controlled the council because the ACDP councillor had swapped sides to the ANC. They held a meeting on the 15th of October where they designated the ACDP councillor as mayor and appointed a new acting Municipal Manager. A court battle followed, because the DA asserted that these pronouncements were unlawful given that the ACDP councillor’s membership of his party was terminated on 14th October and therefore he was no longer technically a member of the town council at all. On Tuesday the Supreme Court of Appeal ruled that the DA has legitimate control over the town council. Reports suggest that the Swellendam unrest began shortly afterwards as a result of dissatisfaction with the court decision. The DA appears convinced that the ANC is deliberately fomenting anger among residents in order to serve its political end goals. ENCA reporter Leigh-Anne Jansen was in Swellendam on Thursday night, where tensions flared between police and protestors at the entrance to Railton, an informal settlement. Jansen and cameraman Tommy Davids were forced to beat a retreat from the action when their clearly-labelled news van was stoned, with the windscreen cracked from a hurled rock. Jansen told the Daily Maverick that it was difficult to know what to attribute this change in mood to: “They were fine with the media all day,” she said. Swellendam was not the only town which experienced disruption on Thursday unlinked to the original farmworkers’ protest. In the coastal town of Gansbaai, an estimated 300 people – said by Eyewitness News to be workers at the Atlantic Abalone Farm – marched in protest against low wages. These workers were reportedly demanding that their salary be doubled. Elsewhere in the province, despite the government’s agreement to re-examine the minimum wage next week, many farmworkers continued to stay away from work. The Food and Allied Workers Union (FAWU) said that farmworkers were frightened to return for fear that they would be victimised. Another probable cause is that word of the strike being called off may not yet have reached all affected communities by Thursday morning, like the original protest hot-spot of De Doorns, where it was estimated that majority of permanent workers are still on strike. While rubber bullets have been known to kill people – notably Ficksburg resident Andries Tatane – it seems increasingly likely that police did indeed use live ammunition on the Wolseley crowd. The Cape Times report quoted a resident of the town who said that police had warned protestors that they had run out of rubber bullets and would have to start using live ammunition if protestors continued to throw rocks at them. The notion that the police were using live ammunition is also backed up by the testimony of the Daily Maverick’s source at a Ceres hospital, who confirmed on Thursday that he had treated a total of five people on Wednesday who had been hit by live ammunition, including one who had been shot through the pelvis. The doctor said he had no knowledge about the circumstances of Daniels’ death, but he believed that the five bullet casualties had come from the same Wolseley skirmish that killed Daniels. This also fits police spokesperson Andre Traut’s statement that “five other people have been injured during the same incident”. The Ceres doctor said that on Wednesday night the hospital had treated 15 workers from the Koue Bokkeveld (north of Ceres). One of these had been shot in the eye (with riot ammunition). Another man had been shot with what the doctor described as “buckshot” – little iron balls. “He had over 120 little iron balls in his back,” the doctor said, while clarifying that although this would be painful, it would not cause serious damage. The doctor said that there were rumours that some of the 15 casualties – including the man injured with the so-called buckshot – had been shot by the private security firms which some winelands farmers have contracted to protect their land. Joanne Otto, spokesperson for the Cape Winelands Department of Health, told the Daily Maverick that the regional hospitals had thus far registered 34 casualties and one death (Daniels’ – rumours of the death of a Wellington farmer were revealed to be false). Of these, 25 had been discharged immediately. Three had been transferred to Tygerberg Hospital in Cape Town with facial injuries. Over the same period, the hospitals had treated one police officer, admitted with an injury to his head where a rock had struck him, but subsequently discharged. Aside from the human toll, the cost of the protests in other regards was still being tallied. Western Cape Premier Helen Zille said on Wednesday that she expected the monetary value of destruction wrought by protestors to run to millions of rand. Saying that the Western Cape stood on the brink on anarchy, Zille appealed to President Jacob Zuma with increasing urgency to deploy the SANDF to the area. In a statement released by the Presidency on Thursday, Zille was told to seek help from the relevant individual Ministers rather than the President. “Regarding the deployment of troops that Ms Zille has referred to, it should be recalled that the president approved the employment of the SANDF in September, to assist the police in areas around the country where there has been unrest,” ran the statement. “Premier Zille is again urged to speak to her colleagues, the Ministers responsible, to discuss the request.” In other words: bugger off, Jacob doesn’t want to get involved. The Daily Maverick asked Zille if she was convinced that the deployment of the army in the region was the best solution, given the indications that police might already be behaving in a slightly trigger-happy fashion. Zille said in response that it was her conviction that a military presence would lead to a decrease in violence. “Army patrols would help to minimise and prevent violence by assisting the police, who are severely stretched during this crisis, to contain the situation,” she told the Daily Maverick via email.